Welcome to Week 5 of our Pet Photography Blog Circle! This week’s topic is red…. Guess what my take is? Go Patriots!!! We are big football fans in our house, so of course Kota is, too! The New England Patriots will be playing in the Super Bowl on Sunday, Feb. 3rd – which is also my Birthday, so of course they MUST win! The Patriots played on Feb. 3rd in 2008…. and unfortunately lost to the Giants – ugh! Fingers crossed the are going to win on Sunday in Atlanta! The Patriots team colors are Red, White and Blue. Kota has a lovely bandana and collar of the team. The last game during overtime I realized Kota didn’t have her team collar on. I made her wear it and guess what? The Pats are going to the Super Bowl! Umm…. I’m not superstitious at all haha!!! 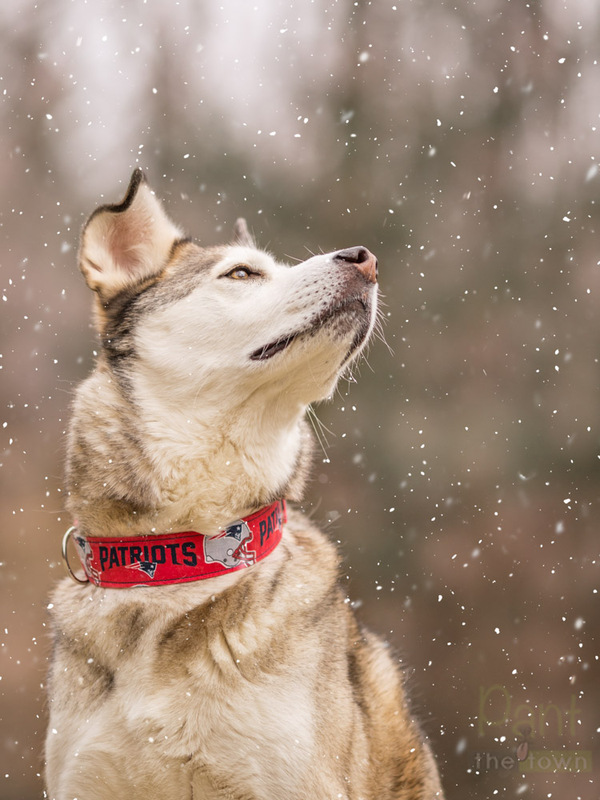 Here she is in her RED Patriots collar – unfortunately the owner is no longer selling collars or I’d add the link. 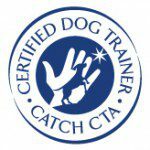 She did amazing custom collars for dogs! This image was taken the day before we had snow this past week so I added a little bit just for fun. Next up is Kota’s bandana showing her team support! “Did you say New England?” with a slight head tilt! The day after I took these images, we had SNOW! Woohoo! The news hasn’t been doing the best job with weather predictions. The 4-8 inches ended up being only 3 or 4. On a good note they predicted it all changing over to rain on Wed. morning and we actually had sun shining with a blanket of snow! I couldn’t NOT take some pictures on Wed. morning, so I added a red scarf to Kota with the beautiful golden light. Thanks for stopping by and checking out some Kota portraits in red! Will you be watching the Super Bowl this Sunday? Do you have a pick? Next up in our blog circle is Pawparazzi Pet and Animal Photography presented by Shae Pepper Photography. Shae does a lot of traveling with her pup, Truffles, and I’m looking forward to seeing her take on “red” for this week’s blog! Happy Weekend! Those are beautiful images of Kota. The depth of field is gorgeous. Love! My favorite is the last one with the red scarf. Good luck to your team today! Kota definitely makes for a cute cheerleader! 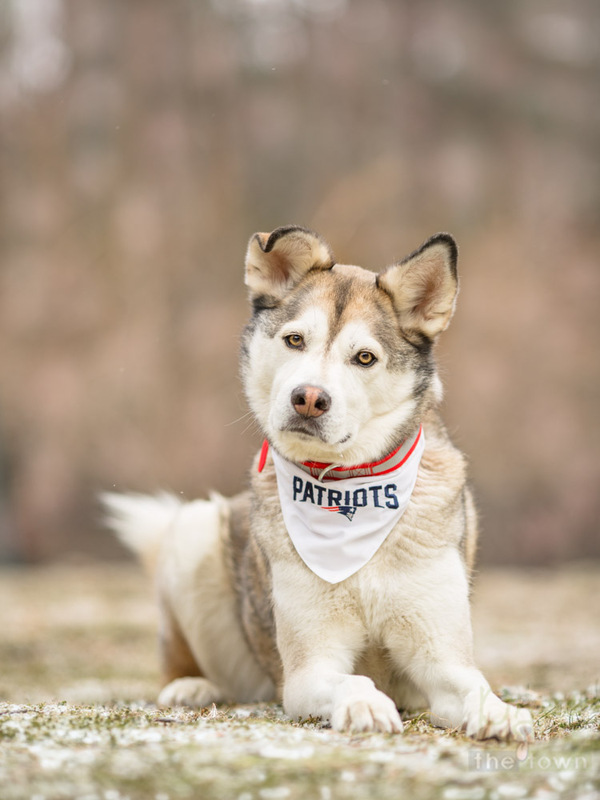 Seems to be good luck – Kota loves the Pats. Agree Red looks great on her – luv the images! Kansas Jayhawks, B’s and Celts next! 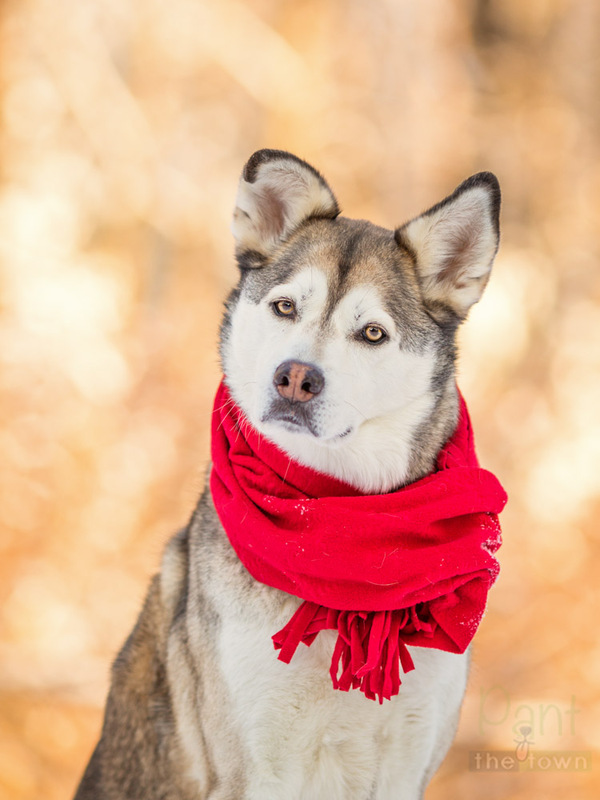 The red scarf is my favorite, but I am not a big sports fan. LOL. Super Bowl? To me it’s what I grab when I make too much popcorn. Love the background bokeh on the last photo as well. I love the tones in your photos Darlene and the pop of red.